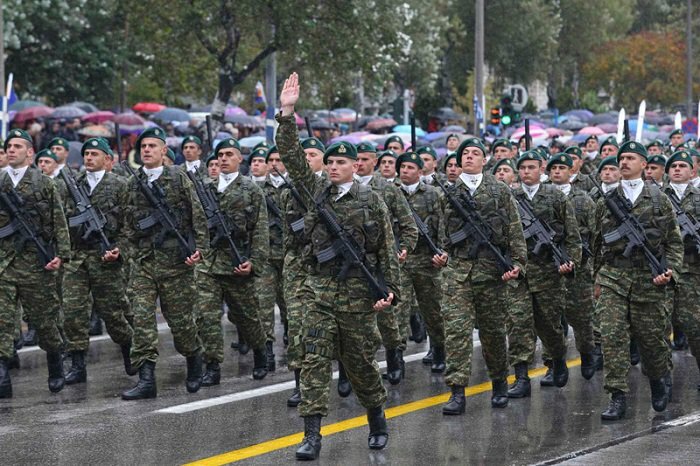 Thousands of people gathered in the center of Thessaloniki to watch the military parade to commemorate the ‘OXI Day’. Greek military units, including armored vehicles, tanks, infantry and Special Forces marched in front of the President of the Hellenic Republic Prokopis Pavlopoulos. For the first time this year, units of the Greek navy also participated in the parade. “Heroes fight like Greeks. Happy celebrations, Greece” said F-16 Squadron Leader Loukas Theoharopoulos to the ground control while executing flying maneuvers in the Thessaloniki skies. The message was relayed live via microphone to officials watching the demonstrations, who applauded warmly. President Pavlopoulos hailed the spirit of the “OXI Day”, saying it serves as a beacon during turbulent times. “The United ‘No’ with which Greeks responded to the Italian invasion on October 28, 1940, constitutes, forever and especially in today’s turbulent times, the forefront of our nation’s spirit,” Pavlopoulos said after attending the military parade in Thessaloniki. “It is the timeless ‘No’ towards anyone who threatens our borders, our territorial integrity, and our national sovereignty. A ‘No’ that automatically transforms itself into a ‘Yes’ for Peace, Democracy, Justice and Fundamental Human rights,” he added.